To celebrate the 60th anniversary of the seminal paper “Stochastic Games” of L.S. 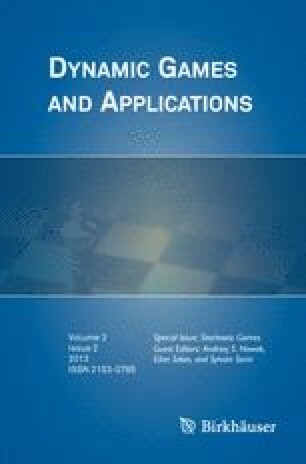 Shapley , Dynamic Games and Applications is proud to publish this special issue. Shapley’s paper on stochastic games has had a tremendous scientific impact on the theory and applications of dynamic games and there is still a very active research on these domains. In addition, as can be seen by the content of this volume, the theoretical model as well the potential for applications develops in new directions including continuous time framework, link with evolutionary games, algorithmic game theory, economics, and social networks. fixed points and index of equilibria. stochastic strategic market games [6, 9]. We would like to thank the contributors to this special volume. We are also grateful to Georges Zaccour, the Editor-in-Chief, for inviting us to edit this issue and for facilitating the editorial process. Special thanks are also due to all the reviewers for their criticisms and suggestions, without whom this issue would not have been possible. We are also grateful to the editorial team in Springer for very good cooperation and constant help. The reader may visit: http://www.nobelprize.org/nobel_prizes/economics/laureates/2012/.